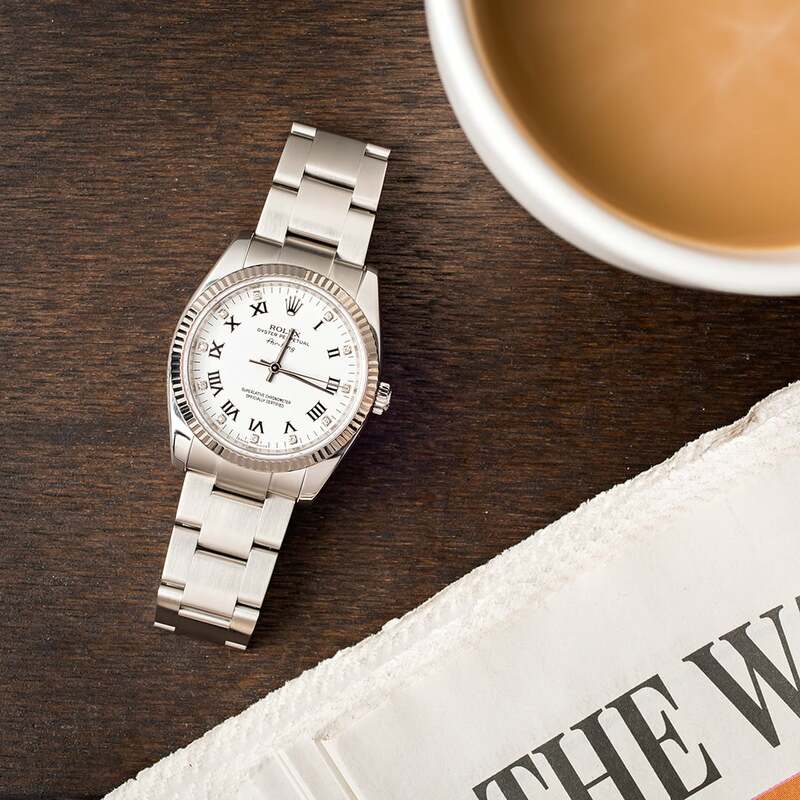 If the thought of a men’s Rolex diamond watch makes you immediately think of overly embellished flashy pieces, then we’re here to show you some fantastic alternatives that don’t subscribe to that style. Rather than fully iced-out watches, these four models offer a more subtle approach to wearing diamonds on a man’s watch. From a Submariner to an Air-King and some in between, here are four great ways to wear a men’s Rolex diamond watch. The Submariner Ref. 11613 can come with a serti dial displaying sapphire and diamonds. First up. we have a super cool two-tone Rolex Submariner ref. 16613 with a slate Serti dial. 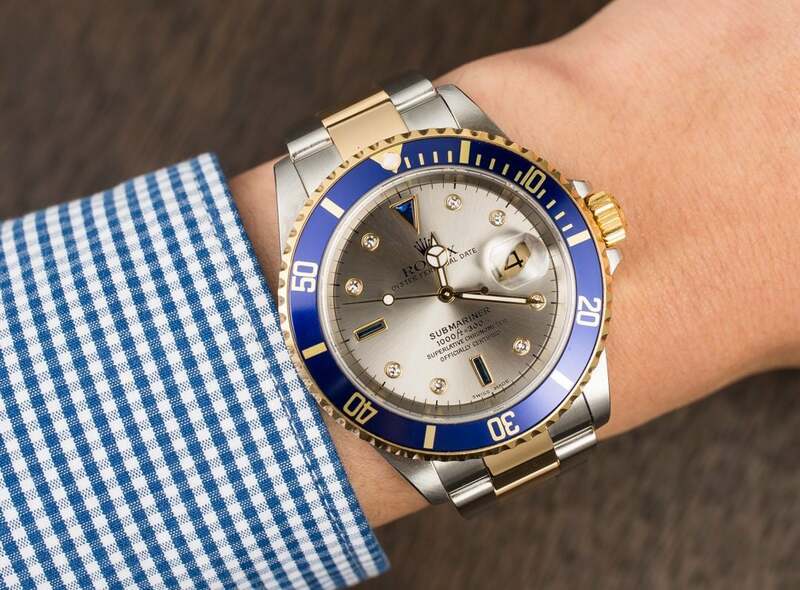 While Rolex uses the term “Serti” as a label for any of their diamond watches, in watch collecting circles, Serti typically refers to a very specific dial style found on select Submariner and GMT-Master watches. This particular Serti dial on the Submariner ref. 16613 houses eight diamond hour markers along with three sapphire indexes. The diamonds complement the gray dial well, while the blue sapphire matches the blue bezel on the 40mm case. Coupled with the two-tone Rolesor metal combination, this Submariner Serti comes together for a very appealing Rolex diamond watch. This Day-Date Ref. 118238 comes with a diamond and a mother of pearl. 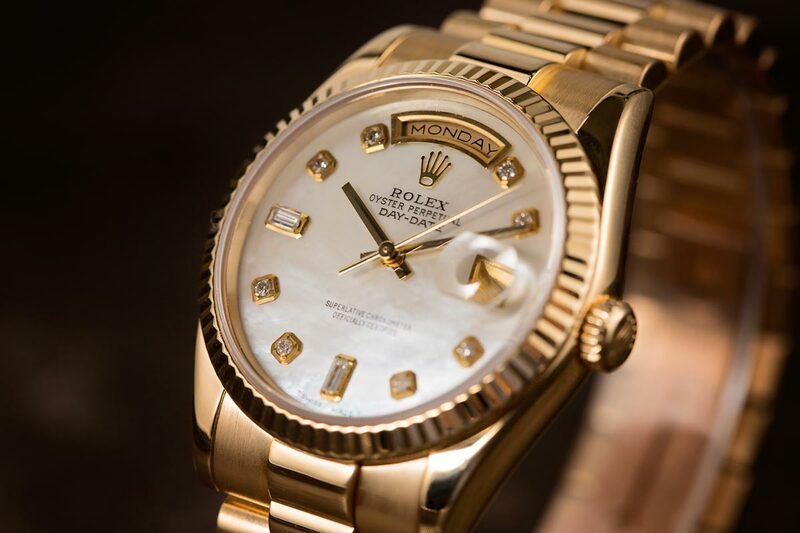 Yellow gold and diamonds is a classic Rolex combination. And it doesn’t get much better when that combo is on a Rolex President watch. But rather than a full diamond Rolex President, one with just a few gem touches on the dial works best as a men’s luxury watch. Take, for instance, this yellow gold President ref. 118238 from Rolex’s current lineup. Note the eight brilliant-cut diamond index joined by two baguette-cut diamonds at 6 and 9 o’clock. This design layout makes way for the characteristic duo of windows at 12 and 3 o’clock to indicate the day and date, respectively. With its iconic solid yellow gold 36mm Oyster case, fluted bezel, President bracelet, and silver dial with diamonds, the Day-Day 36 ref. 118238 is a stunning example of a dressy Rolex diamond watch. 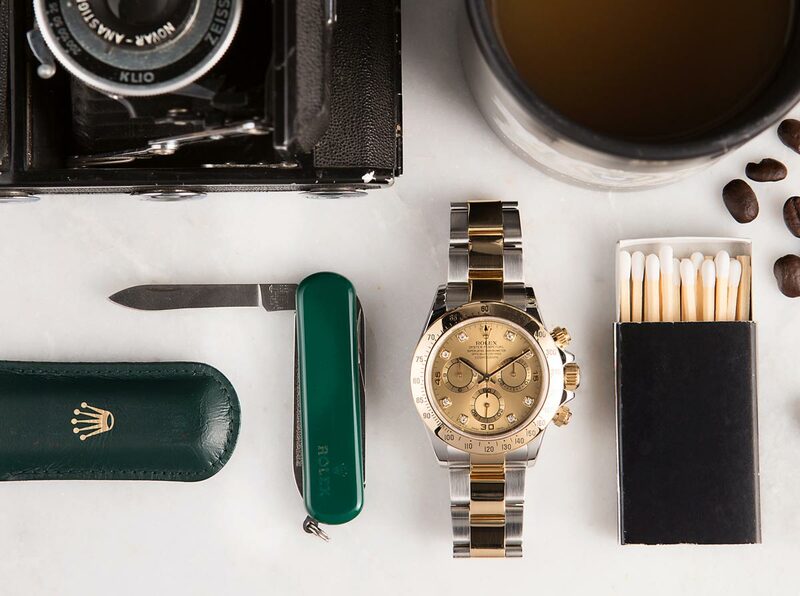 Rolex’s sportiest model, the Daytona chronograph, actually wears diamonds surprisingly well. Especially on two-tone steel and yellow gold models, such as the Rolex Daytona ref. 16523. Five-digit Daytona references indicate that they are Zenith Daytona versions running on Cal. 4030, which are modified Zenith El Primero automatic chronograph movements. These are the models that came before Daytona watches equipped with in-house Cal. 4130 movements and after the manual-wound vintage Daytona watches. The champagne dial of this particular Daytona ref. 16523 pairs well with the 18k yellow gold bezel on the 40mm case, winding crown, and center bracelet links. Additionally, the eight diamond hour markers add even more luxuriousness to an already ultra luxurious chronograph. A diamond Daytona is a sporty way to wear a Rolex diamond watch. As one of Rolex’s entry-level models, a diamond Air-King may come as a surprise to some. However, the Rolex Air-King ref. 114234 is indeed a higher-end version. Not only does it boast an 18k white gold fluted bezel on the 34mm stainless steel case, this version of the Air-King ref. 114234 also shines a little brighter thanks to 11 diamonds sitting along side the Roman numerals. The white dial, monochrome metal construction, black numerals, and white diamonds marry well to produce a casual, yet chic Rolex timepiece. Better still, the Air-King ref. 114234 is one of the most affordable ways to wear a men’s Rolex diamond watch. Diamond Do? Or Diamond Don’t? These four models show the diversity of diamond Rolex watches. Sporty or classic, dressy or casual chic, the choices are varied. So if you’ve been skeptical of diamond watches in the past, take a closer look and the options may just surprise you. 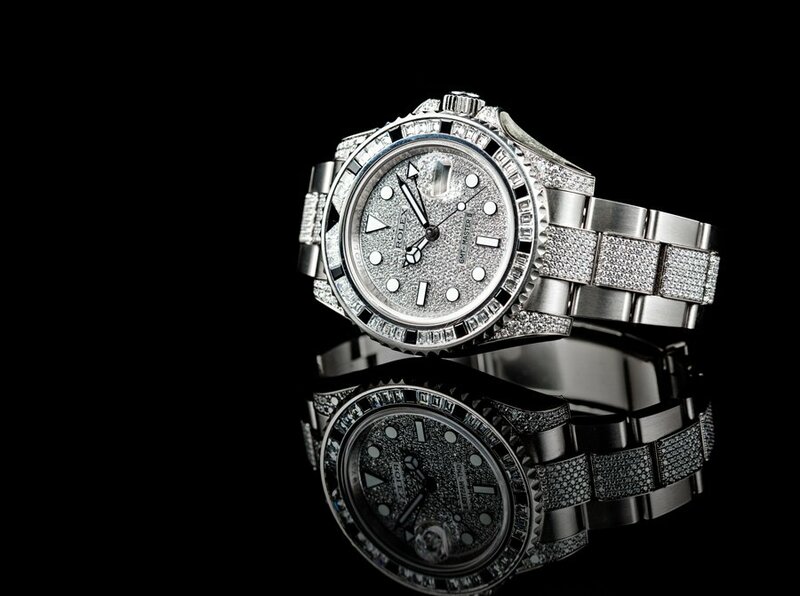 What do you think of a Rolex diamond watch for men? Do you appreciate them or avoid them? Share your thoughts with us below.